LEAP economics: It's time to take over the banks! Get along to an excellent meeting tonight at 7pm in Westminster to discuss the public ownership of the banks. At TUC Congress last year, unions voted in favour of an FBU motion calling for the public ownership of the banks. At the meeting tonight, to be held in Committee Room 6 in the House of Commons, FBU general secretary Matt Wrack will discuss the campaign alongside LRC and LEAP chair John McDonnell MP. 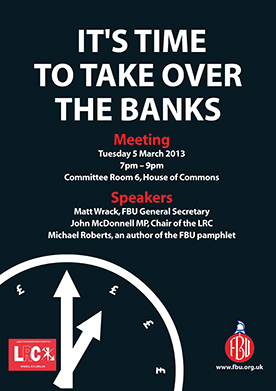 The meeting will also hear from Michael Roberts who, alongside Mick Brooks, wrote the excellent FBU pamphlet 'It's time to take over the banks' (pdf). The pamphlet makes the case for a publicly owned finance industry that provides a public service, giving financial support to industry and working people. Taking over the banks will enable planning, investment and the creation of millions of jobs. A publicly owned and democratically accountable banking system is essential to developing such a programme. The meeting is open to all and free to attend, but allow 10-15 minutes to get through parliamentary security. In a Comment is Free piece yesterday, PCS general secretary Mark Serwotka also made the public ownership of the banks one of his 10 steps to kickstart the UK economy. So far, the article has an 89% approval rating! The power that the banks and financial institutions have obtained means they can frequently dictate policy to the government. In this new form of inverted totalitarianism, it will be interesting to see if this much power and influence in one sector of civil society will cause even more social unrest.